Platsr.se if you isn’t familiar is a web community for gathering local stories and media around different locations. As of a result it got some pretty incredible data users has put a lot of thought into all all available under open licenses. Platsr also got a API and have been having one for ages, but almost no one has created upon it. If you take a look at the official documentation you won’t find that fact weird(even if you do read Swedish). Only because you provide an open API you do not make it accessible. Actually you can throw huge piles of money into developing an amazing API and developers will never end up using it anyway. 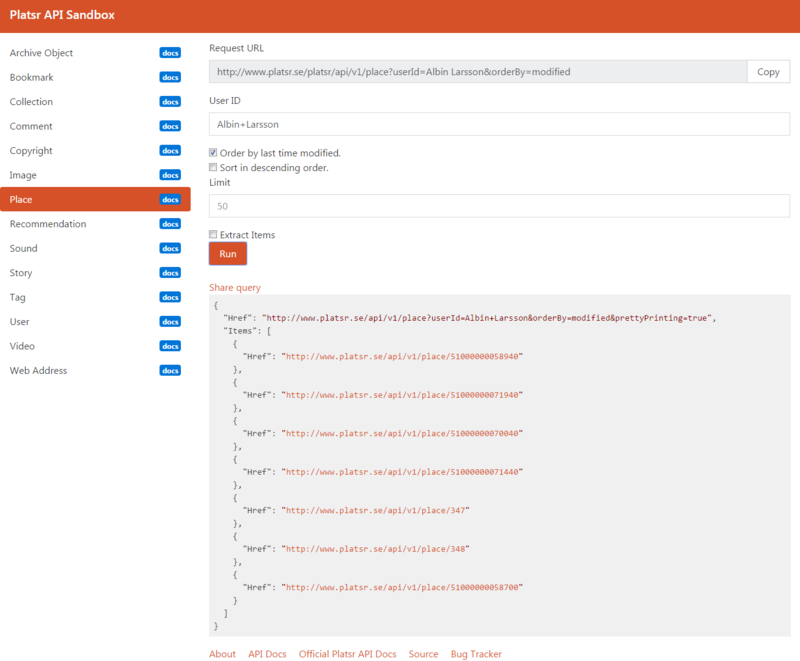 I decided to rewrite the Platsr API documentation and create a API Sandbox for it. 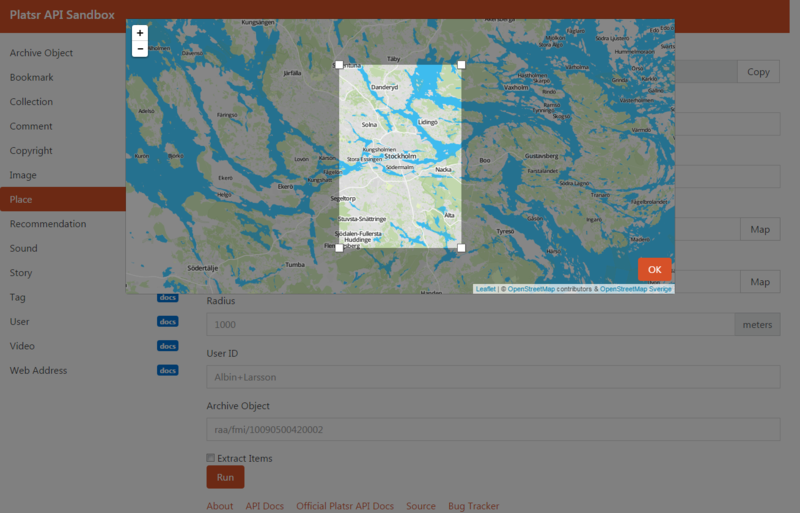 Visual interface for geographic queries, bounding boxes etc. Tied closely with the documentation for usability. Only relevant parameter fields for your specific query should be displayed. Users should be able to share queries with direct links. Resources within the response body should link to it’s sandbox query. Rewriting all the documentation from scratch took a train trip between Oslo and Katrineholm(roughly five hours). Nothing the original developers could not have invested in from the beginning. Building the sandbox on the other hand took a lot more time then it would have taken me to write the actual API. In the end I ended up being relay happy about the end result you can try the sandbox out and access the documentation right now. Please let me know what you think so I can make even better sandboxes and documentation next time! Tip: When developing APIs write the documentation first then use it as a blueprint for the actual development. Would you like to talk to me about open data/data accessibility, hacks/projects or anything else? I will be attending both Hack4Heritage in Stockholm and Hack4NO in Hønefoss, make sure to catch me there!